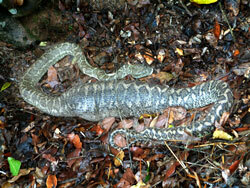 Reptiles found in the Kedron Brook Catchment include turtles, lizards and snakes. 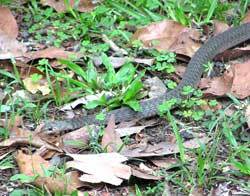 Little is known about the complete range of reptiles within the bounds of Kedron Brook catchment and their distribution, so the following information is of a general nature. Reptiles are ectothermic, which means they rely on an external heat source such as the sun to raise their body temperature to an optimal level for normal activity. The skin of a reptile is generally dry and scaly. Sometimes the scales are modified to form ridges or spines to aid in defence or camouflage. The kidneys of reptiles work quite differently from those of mammals and birds. Instead of producing urine, a reptile’s kidneys produce a dry uric acid. This helps retain water in the body and enables reptiles survive in some of the driest climates on Earth. Reptile scats (faeces) can be identified by their black solid waste component and white urates. It may be possible to find three species of freshwater turtles in Kedron Brook: Eastern Long-Necked Turtle, Saw-Shelled Turtle and Brisbane Short-Necked Turtle. The Long-Necked Turtle is also known as the Snake-Necked Turtle and can be found in standing water and ephemeral (temporary) wetlands. It can be easily identified by the unique colouring on its plastron (underside) and its long neck. The plates on the plastron are creamy-yellow, edged with black. The Long-Necked Turtle feeds on aquatic insects, crustaceans, fish, tadpoles and frogs. 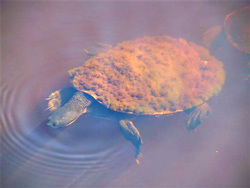 The Short-Necked Turtle inhabits standing water bodies and permanent slow-moving streams. Its carapace (upper shell) is approximately 20-23 cm long. It has a white stripe along the side of its face. The Saw-Shelled Turtle inhabits flowing streams. As the name suggests, the hind edge of the carapace is heavily serrated, except in older animals. Its neck is short and spiny. Saw-shells are carnivores, eating tadpoles, fish, frogs, aquatic insects and even cane toads. There are four families of lizards represented in the Kedron Brook Catchment: skinks, dragons, geckoes and flap-footed (legless) lizards. The scales of skinks are usually glossy, smooth, flat and overlapping. The limbs of skinks vary from long and well developed on skinks that are active runners and climbers, to virtually limbless. Most skinks have the ability to ‘drop’ and regenerate their tail. In most skink species the males and females are very similar in colour and pattern. 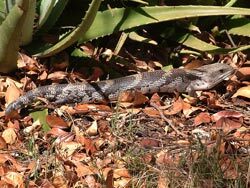 One of the most commonly seen skinks around Kedron Brook is the Common or Eastern Blue-tongued Skink. 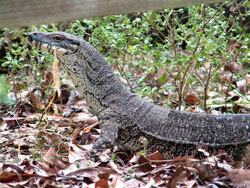 The Blue-tongue is one of the largest skinks and can reach over 50cm in total length. It is a robust lizard with a triangular head and distinct neck. As the name suggests its tongue is violet-blue. The overall colour can be variable but generally consists of dark and pale cross-bands in browns and greys. It has short legs, is generally slow moving and not a skilled climber. Its tail is rather solid and relatively short. Blue-tongues are diurnal (active by day). They give birth to live young throughout the summer months. The Eastern Water Skink is common where-ever there is a constant water supply and suitable cover. The largest of the water skinks, it can reach a total length of greater than 25cm. It is a robust skink with a long, slightly vertically compressed tail. The Eastern Water Skink is a metallic bronze above with a pale yellow line running along the body between the back and flanks of the skink. The upper flanks are black with small white spots. The lower flanks are pale grey mottled with darker grey. The Eastern Water Skink feeds on beetles, aquatic larvae, spiders, snails, small fish, native fruits and berries. Live young are born in summer. All dragons have well developed limbs, making them fast runners and good climbers. Some are excellent swimmers. They also have excellent hearing. Most dragons are diurnal (active during the day). The skin folds above the eyes have well developed brow scales that shade the eyes, protecting them from the direct sun. The remaining head and upper body scales are dull with distinctive sharp points. In some dragons these form spines. Dragons are generally insect eaters, but the larger dragons may eat smaller lizards, small mammals and birds. Some dragons also eat flowers, fleshy leaves and fruits. Males and females of most species are similar in colour and pattern but the males are often larger. In the breeding season males tend to be more brightly coloured and patterned. Dragons will display by arm-waving and head-bobbing. 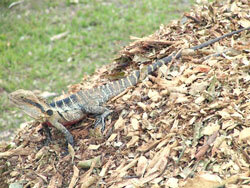 The Eastern Water Dragon is commonly seen along waterways, including Kedron Brook. It is a large dragon and can reach a total length of over 80cm. The water dragon has an angular head with a crest of spines that continues down its back and along its laterally compressed tail. Its body is an overall yellow-brown colour with dark bands. A dark stripe extends from behind the eye to the neck. In breeding the males’ chest and belly can become a vibrant red. It is well equipped with strong limbs for climbing and swimming. The water dragon has a diverse diet including: cicadas, spiders, grubs, frogs, fruit (especially fallen figs and lilly pilly), flowers, smaller lizards, yabbies and fish. The Eastern (Common) Bearded Dragon is the dragon most likely to be seen in suburban backyards. It can reach a total length of up to 55cm. The overall body colour is blotched grey. Low spines cover the back, tail and legs. A collar of spines runs across the back of the neck and around the lower edge of a pouch-like ‘beard’. When threatened the pouch is erected and the mouth opened to reveal a bright yellow interior. Food for the eastern bearded dragon includes insects, spiders, small lizards, flowers, fruits and fresh shoots. Geckoes are small, generally less than 20cm. Their large eyes are permanently covered by a transparent lower eyelid which is fused to the upper lid. Cleaning of the transparent eyelid with the tongue is characteristic of geckoes. The fingers and toes of geckoes are well developed with pads or claws (or both) at the end of each digit. Those with pads are climbers and live on steeply sloping surfaces such as trees and rock-faces. Those with claws are ground dwellers. Like the skinks, geckoes can drop part of their tail and it will regenerate. Geckoes feed only on moving prey, including spiders, insects and scorpions. Geckoes have well developed hearing. The most common gecko in Kedron Brook Catchment is not a native. It is the introduced Asian house gecko, the only non-native gecko in Australia. The Asian House Gecko is about 9cm long, and pale grey to fawn in colour with darker mottling. There is a row of small spines along the edges of its tail. The Asian House Gecko is common inside houses and most easily identified by its distinctive “chuck-chuck-chuck” call. 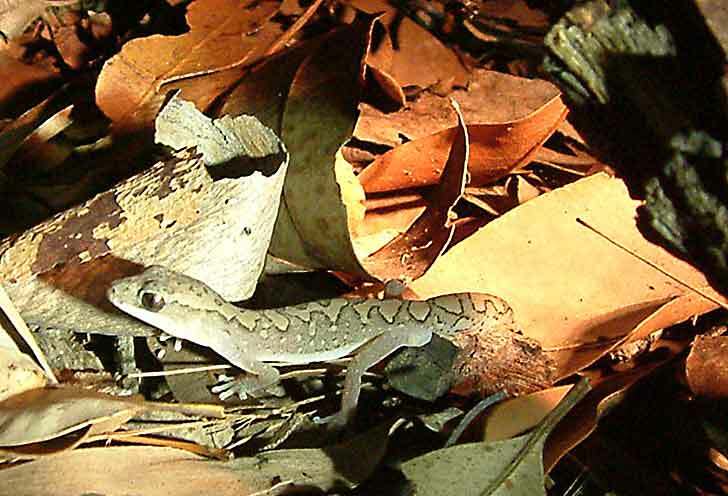 Another gecko that may be seen in the Kedron Brook Catchment is the Robust Velvet Gecko. It grows to about 15cm, and is grey in colour with large pale, dark-edged blotches along the entire length of its body and tail. Very small, regularly shaped scales give a velvety appearance. The Robust Velvet Gecko is strictly arboreal, sheltering in tree hollows and under loose bark by day, and foraging on the trunks and lower limbs of trees at night. Legless lizards generally have no forelimbs and just a small pair of scaly flaps either side of the vent. This flap-like remnant of hind limbs gives legless lizards their other common name of flap-footed lizards. Surprisingly, legless lizards are more closely related to geckos than they are to snakes. They have fused transparent eyelids that they clean with a slightly elongated tongue. Legless lizards can also drop and regenerate their tail. A legless lizard’s tail is about three to four times the length of its body; a snake’s tail is a lot shorter than its body, usually less than one quarter of the snake’s total length. The Common, or Leaden, Delma is quite common throughout the western and northern suburbs of Brisbane, including Brookfield and Everton Park. It reaches about 35-40cm in length and is uniform brown to olive in colour, except for dark patches on the head and neck. 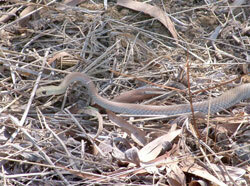 The common delma shelters in leaf litter, under logs or rocks, or under the apron-like leaves of old grass tussocks. Another legless lizard that may be found in the Kedron Brook Catchment is the Three-toed Worm-Skink, or Verreaux’s Skink. It grows to about 38cm. Not completely legless, Verreaux’s Skink has small forelimbs each with three very short clawed toes. It is yellow below and juveniles have a pale yellow collar. Verreaux’s Skink lives in a tunnel under a rock or log and in adjacent mulched soils. It feeds on crawling insects, insect larvae and spiders that venture too close to the tunnel entrance. Pythons are non-venomous with large, backward curved teeth, but no hollow fangs.�A python kills its prey by constriction.�Pythons have heat sensory pits along the lower jaw that allow them to locate warm-blooded prey. They can detect temperature changes of less than one thirtieth of a degree.�Blind snakes are short (less than 40cm), worm-like burrowing snakes with dark pin-point eyes.�Their small, glossy, close-fitting scales give then a smooth appearance.�Blinds snakes often live in enlarged galleries within the nest of their insect prey � termites and ants.�Following rain, they may emerge to forage on the surface and shelter under rocks of fallen timber, or in cracks in the ground.�Blind snakes are cryptic and rarely seen. 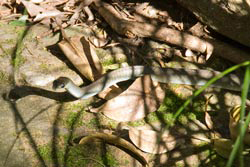 The Small-Eyed Snake is common in most Brisbane suburbs and surrounding bushland.�It is aggressive if provoked and dangerous to humans.�The back, sides and head of the Small-Eyed Snake are an immaculate glossy blue-black.�There is a narrow area of coral pink on the belly.�The Small-Eyed Snake is somewhat similar in appearance to the red-bellied black snake but much smaller.�While red-bellied blacks often reach 1.5m and can reach as long as 2m, the Small-Eyed Snake rarely reaches 1m and is usually only about �m.�Both snakes are dangerous to humans.�The Small-Eyed Snake is nocturnal and feeds predominantly on lizards and sometimes frogs.�Females give birth to live young from October through to February. Another snake that is potentially dangerous to humans, especially children, is the Yellow-faced Whip Snake.�This slender snake has a long thin tail and large prominent eyes surrounded by an obvious pale ring.�A dark streak curves back from the eye to form a distinct comma.�Overall, the Yellow-faced Whip Snake is bluish grey in colour with a rusty flush along the forebody and a greenish belly.�Abundant in all Brisbane suburbs, it is often found sheltering under rocks or sheets of iron.�It is active by day and all year round.�It feeds on small lizards.�The female lays approximately six eggs in early summer, sometimes in large communal nests. 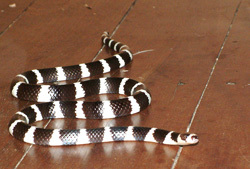 The White Crowned Snake is common in all Brisbane suburbs, with compost heaps being a favourite place to shelter.�It reaches about �m in length and is dark grey all over except for a broad white band that extends across the back of the neck and sweeps forward around the sides of the head and onto the face.�This white band encloses a dark patch and gives the snake its common name of �white-crowned�.�The White Crowned Snake is nocturnal and feeds on small skinks.�Females lay an average of five eggs per clutch during Spring and Summer.�It is virtually harmless to humans. 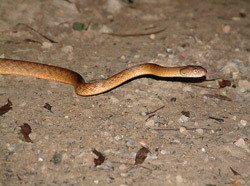 The Brown Tree Snake reaches 1.3 to 2m in length.�It is pale reddish-brown above with indistinct darker cross bands on the back and sides.�The belly is cream to apricot.�Its body and tail are quite slender, but its head is rather bulbous.�The snake�s eyes are large and protruding with vertical cat-like pupils.�This is a �rear-fanged� snake with venom glands connected to fangs at the back of the upper jaw.�Common in all suburbs and adjacent bushland, the Brown Tree Snake can be found coiled on rafters in buildings, narrow caves, tree hollows and foliage, and on the ground.�It is an agile climber and able to extend its body across gaps between branches.�If provoked, it will recoil into an �S� position with its head and neck, striking with an open mouth.�It is virtually harmless to humans, but large individuals should be treated with caution.�The Brown Tree Snake is nocturnal, feeding on lizards, bats and other small mammals, and birds.�The female lays 4-10 eggs in a deep humid crevice. Another commonly found tree snake in Brisbane is the Common or Green Tree Snake.�This is an extremely slender snake with a whip-like tail and large dark eyes.�Its colour can vary greatly.�The back and sides can be olive, green, brown, black, or even, on rare occasions, royal blue.�This colour diffuses into a yellow colour with the most intense colour on the throat and lower face.�The Green Tree Snake is the most commonly encountered snake in Brisbane but it prefers to avoid humans and reside in lush vegetation near watercourses.�It can be seen, however, in gardens and houses, on the ground or in trees.�Having no venom glands or fangs, it is harmless to humans.�The Green Tree Snake is active by day and feeds on frogs and skinks.�The female lays 6-12 eggs in summer, in a deep humid crevice or rock cavity. The Carpet Python is well known to many suburban residents.�It is a large snake or around 2 � m, that can be easily spotted draped over exposed ceiling beams, hanging in trees, slowly making its way across a back yard, or coiled up asleep in the undergrowth.�The background colour of the carpet python is olive to brown.�Along the full length of the snake are distinct fawn-coloured patches that are edged with a much darker border.�There is great variability in the background colour, and in the size and shape of the paler patches.�Carpet Pythons can be active by day and by night.�They feed on warm-blooded prey including rats, birds, small mammals and, occasionally, small domestic pets.�Attempts to feed on cane toads are generally fatal.�The Carpet Python�s behaviour can be unpredictable, and they will bite.�They are non-venomous but a bite can cause lacerations and tetanus protection is recommended.�The female can lay any number of eggs from less than 10 to more than 30.�Young hatch in mid to late summer. Most blind snakes are sparsely distributed and not commonly encountered by humans.�Identification can be difficult and a call to the Queensland Museum is recommended if a definitive identification is required.�There are at least four species known to be found around Brisbane in urban bushland and outer areas.�The Brown-snouted Blind Snake has a slender, thread-like body and is pink in colour.�It has been found under flat stones and fallen timber that are well embedded in the soil.�Proximus Blind Snake is more robust and grey in colour.�Individual specimens have been found in a termite nest, under a large flat rock in woodland, under a rotting stump in rainforest and in ant hills.�The Robust Snake has purplish-black back and sides with an abrupt border with yellowish under-side and belly.�Robust Blind snakes have been found taking shelter under rocks and timber lying flush with the ground.�The blackish blind snake is the largest of all Australian blind snakes.�The back and sides are purplish grey or brown, grading evenly on the lower sides to a white belly.�It shelters under flat rocks, embedded timber, in the soil and under leaf litter. watch them glide away from a distance. Amongst other quides, look at the reference, "Wildlife of Greater Brisbane", Queensland Museum, Brisbane 2007. This is a great starting reference with concise information and representative graphics. The Museum also gives excellent information on their web site. A link giving access to advice on positive identification, medical advice and first aid procedures is also available on their Snake page. Clear warnings are given in this guide about the potential dangers of snakes to humans together with details of first aid treatment (page 277). Over two thirds of the species found in the Greater Brisbane area are venomous, but only half of these could be considered to be dangerous. 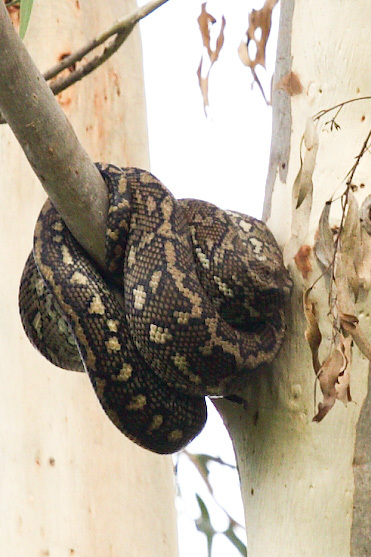 Serious cases of snake bite are not common ( probably less than one actual death per year). In the event of a suspected snake bite, it is important to obtain clear identification of the type of snake involved and fast correct treatment should be sought from ambulance staff (phone 000) or qualified first aiders. Prudent bush lovers will keep handy a small first aid kit including basic snake bite treatment information.